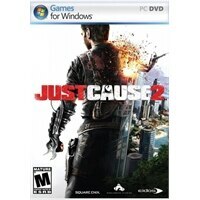 JUST CAUSE 2 - PC Gaming - Electronic Software DownloadJust Cause 2 is a stunning technological leap from the original - Designed with 2nd generation software technology for a true high definition gaming experience. New level of action gameplay in open environments - Only Just Cause 2 delivers action in the air, on the land, and under the water, plus multi-point, real-time vehicle movement and grapple-action that allows players to grab nearly anything within 200 feet. Three times as many missions as the original - All-new abilities and stunts. The best open-world action on the market! Air, land, water and underwater: Just Cause 2 delivers action everywhere from 500 feet above to 50 feet below through jungles, snowy mountainside, deserts, cities and more, with over 600 square miles to explore and destroy. Nearly endless and open-ended game-play: From deep missions to small jobs, to free exploration, players follow the route they want when they want. Grapple nearly everything within 200 feet, including enemies. Progressive destruction - vehicles, building, enemies, and landscape. Pull off amazing stunts with Rico's re-designed parachute. Weapons galore: Single and dual handed weapons, rocket launchers, grenade launchers, explosives, and vehicle mounted weapons. Just Cause 2 is a stunning technological leap from the original - Designed with 2nd generation software technology for a true high definition gaming experience. New level of action gameplay in open environments - Only Just Cause 2 delivers action in the air, on the land, and under the water, plus multi-point, real-time vehicle movement and grapple-action that allows players to grab nearly anything within 200 feet. Three times as many missions as the original - All-new abilities and stunts. The best open-world action on the market!